This catamaran is easy to single hand and sails level even in high winds. It has a fuel efficient 20 HP Honda four stroke engine, GPS, radios, and instruments mounted at the Captains station. It has four overhead mounted solar panels, a portable air conditioner, and a portable gas generator, two staterooms, a large screened in aft cockpit, a dining area, a galley, an electric flushing head, with a separate shower. 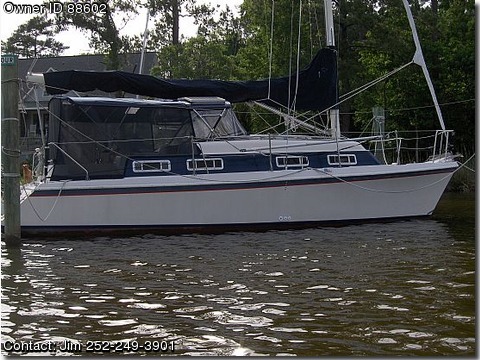 It draws only 2 foot 10 inches of water with plenty of level deck space, a cat walk for easy anchoring, and an aft stairway. This yacht has been pampered by an older couple that has decided it is time to down size to a day sailor. Call Jim (252)249-3901 or email grayjim@embarqmail.com. Sails: Genoa 253 sq. ft. – Jib 117 sq. ft. – Main 430 sq. ft.